NEW YORK -- On Tuesday, IBM introduced a new mainframe called the System z10 Enterprise Class, a machine with up to 100% better CPU performance and triple the memory capacity of its z9 predecessor. 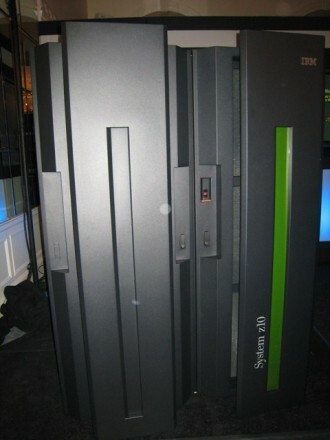 In an event in New York City, IBM senior VP of software Steve Mills called the new mainframe a "commercial supercomputer" capable of tackling any workload. "It's a screamer," he said. But despite the hype, some questions remain as to whether customers will go for System z10 Enterprise Class. a larger physical footprint than the z9, standing more than 6 feet tall, taking up 30 square feet of floor space, and weighing in at about 2.5 tons. IBM also previewed the new version of z/OS 1.10 due out in September. IBM couched its z10 announcement in two related themes: energy efficiency and server consolidation. With the ability to move more than 1,000 virtual Linux servers onto a single z10 box, Big Blue said that companies can save on power costs and precious data center floor space. But it remains to be seen whether IBM can convince new customers to shell out seven figures or more to join the mainframe club. "The challenge for IBM is to take the mainframe to new customers," said Charles King, analyst for research firm Pund-IT Inc. It remains to be seen whether IBM can convince new customers to shell out seven figures or more to join the mainframe club. As part of the presentation, Buzz Woeckener from Nationwide Mutual Insurance Co. detailed his company's foray into server consolidation onto the mainframe. The company has two mainframes dedicated to Linux on z and is running 484 virtual Linux servers on them. The company estimates $15 million in savings over the course of three years. Perhaps more to the point, the company has delayed building a new data center. In 2005, when it began its Linux-on-mainframe project, Nationwide anticipated expanding or building a new data center by mid-2006. Fast-forward to 2007, and Woeckener, a zLinux manager at Nationwide, said that consolidating hundreds of Linux servers onto a mainframe has saved the company in terms of floor space and power costs and has delayed the new data center buildout until 2010. Following the presentation, Woeckener said that tripling the memory on the z10 is what will improve running zLinux the most. The z990 from earlier this decade had 256 GB of memory. Woeckener said you would run out of memory before compute power. The z9 with 512 GB of memory helped improve that limitation, but Woeckener said the 1.52 TB memory capacity of the z10 shows that "it's really built for consolidation." IBM director of System z hardware products John Birtles added that extra memory can also help mainframers running more traditional legacy applications. He said some users are exploring the idea of running a database entirely within memory, a move that could prolong the need for costly capacity upgrades. John Birtles, IBM's director of System z hardware products, detailed some of the other features in the z10. HiperDispatch. This new feature allows mainframers to limit the amount of data that is moved during different sessions. For example, a user inputs data with a certain processor. The next time he wants to access the mainframe, He'll be taken to the same physical area of the mainframe so that data and cache needn't be moved around, which saves resources. Fixed hardware storage area (HSA). The z10 now reserves 16 GB for itself rather than taking it from machine memory. In the past, some users would set HSA as low as possible but would also encounter problems if they needed to expand it. Integrated hardware decimal floating-point processor. Based on a new arithmetic standard that Birtles said is "really about dealing with money," the new decimal floating-point processor helps avoid occasional number-rounding problems that applications encounter. In the z9, this capability was built into IBM firmware. With the z10, it is built into the hardware, which Birtles said is more efficient.